In My PrivateUniverse: challenge completed! 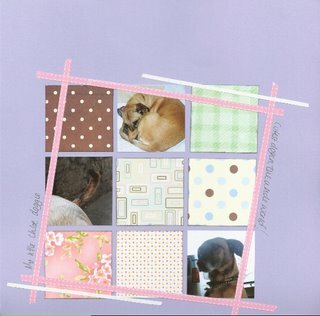 Just completed a fab challenge by Anne Hafermann - posted on her blog. this was so simple, but so great - i used up cardstock i'd had for ages, some pretty awful photos which i cropped right down, and some very random paper scraps. love it! oh and there's a bit of heidi swapp tape in there too for good measure! I'm also the bog beast from hell today.. it's hormones i'm afraid, and i know it is, but i just can't stop being narky! everything is annoying me today.. work was absolute pants, i was so bored i can't tell you.. so i'm afraid i just wallowed in my awfulness and felt bored, pathetic and unfulfilled..
oooh Kathryn, love your layout, really like the wonky HS tape it works brilliantly! Glad to hear the dust and stuff type work is finished, even though I'd rather you'd made it to crop instead!